The state sent more than 97 million metric tons of greenhouses gases into the atmosphere in 2015, compared to just 90 million in 1990. 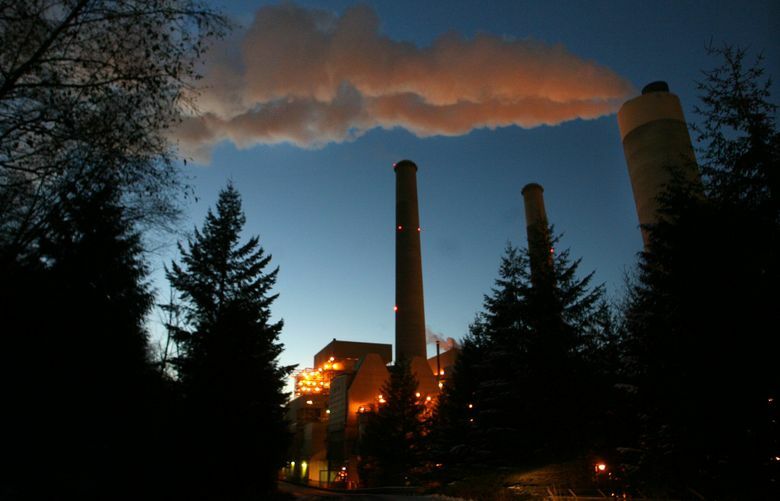 Washington legislators a decade ago wrote into law a plan to reduce greenhouse gas emissions to 1990 levels by the year 2020. But the latest tally of the state’s emissions shows we’re trending in the wrong direction to meet that target and more aggressive emissions goals years ahead. 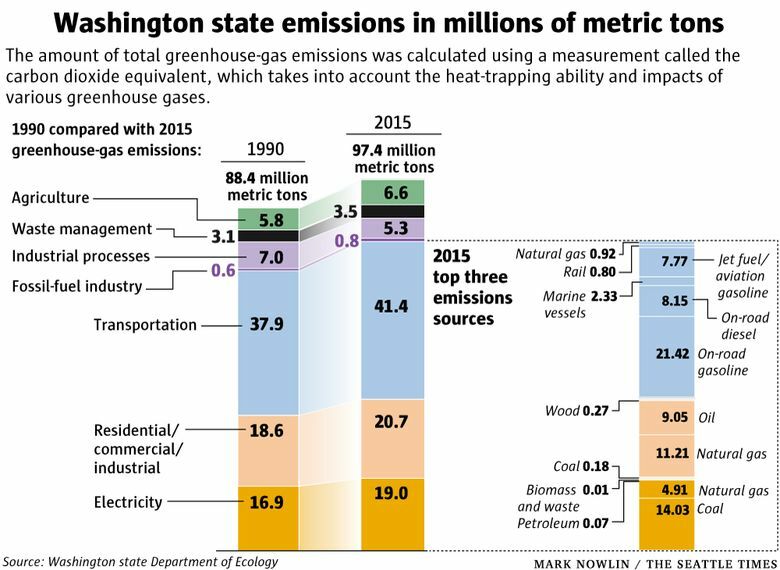 Emissions spiked about 6.1 percent from 2012-2015, due in part to increasing fossil-fuel-generated electricity and a booming economy, according to a new Washington Department of Ecology inventory of greenhouse gas emissions published Monday. The state sent more than 97 million metric tons of greenhouses gases into the atmosphere in 2015, compared with just 90 million in 1990. Although emissions are rising, the 2015 figure represents progress from the year 2000, when emissions topped out at nearly 109 million metric tons. The economy might explain some of the rise in emissions. From 2012-2015, Washington’s economy grew an average of nearly 3 percent a year, and industrial greenhouse gas production rose, too. The drought in 2015 likely contributed to higher electricity consumption figures that year. Washington state relies heavily on hydropower and a hearty water supply to generate electricity. When water supply is low, “you pull more from fossil fuel sources” for electricity, Wineke said. Preliminary 2016 data shows a decrease in electricity-related emissions, Wineke said. Legislators set emissions-reduction targets in 2008. After 2020, the next statutory marker is 2035, when emissions are supposed to drop 25 percent below 1990 levels. Then, in 2050, the state is supposed to cut emissions in half, compared with 1990. Every two years, the Ecology Department is required by law to produce what amounts to a progress report. Climate experts last year delivered dire warnings about the effect of warming on the world, and called for society-altering shifts in behavior and the world’s economy. A U.N. Intergovernmental Panel on Climate Change called for “rapid and far-reaching” changes in energy systems, land use, city and industrial design, transportation and building use. It also found substantial difference in the effects between the Earth’s temperature rising 1.5 degrees Celsius and 2 degrees. A report produced by the U.S. Global Change Research Program detailed expected climate effects in the U.S. The Northwest can expect both more drought and more extreme rain events. If emissions are left unchecked, higher temperatures will likely cause salmon to lose habitat, disrupt Northwest crops like cherries and contribute to more wildfires. State lawmakers began their session Monday, and Democrats, led by Gov. Jay Inslee, are pursuing a suite of legislation to address climate change, including a plan to rid electric utilities of fossil-fuel power by 2045, implementing a clean-fuels standard, pushing incentives for electric vehicles and increasing energy-efficiency building regulations, among other ideas. The Democrats have majorities in both chambers of the statehouse.